Dating apps have recently been gaining remarkable attention all over the world. The busy life of these days probably is the primary reason why people have moved towards a much more convenient method to find their potential future companion. But what kind of applications do we think of when one says dating? Tinder will probably be the first that comes to mind if one were in the US. However, this is quite a different story in Japan. The contents of the article are focused on dating apps in Japan and the US. 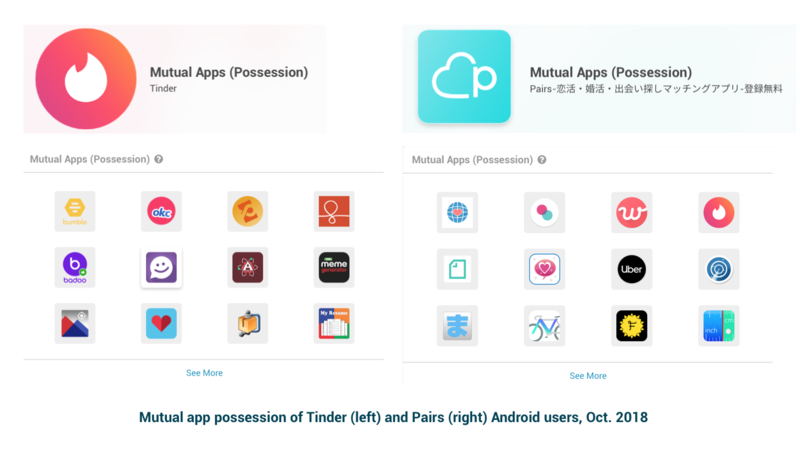 In particular, this article examines and highlights the differences in behavior, activity, demographics and other indicators of Monthly Active Users (MAU) of Android dating apps in both countries in October 2018. 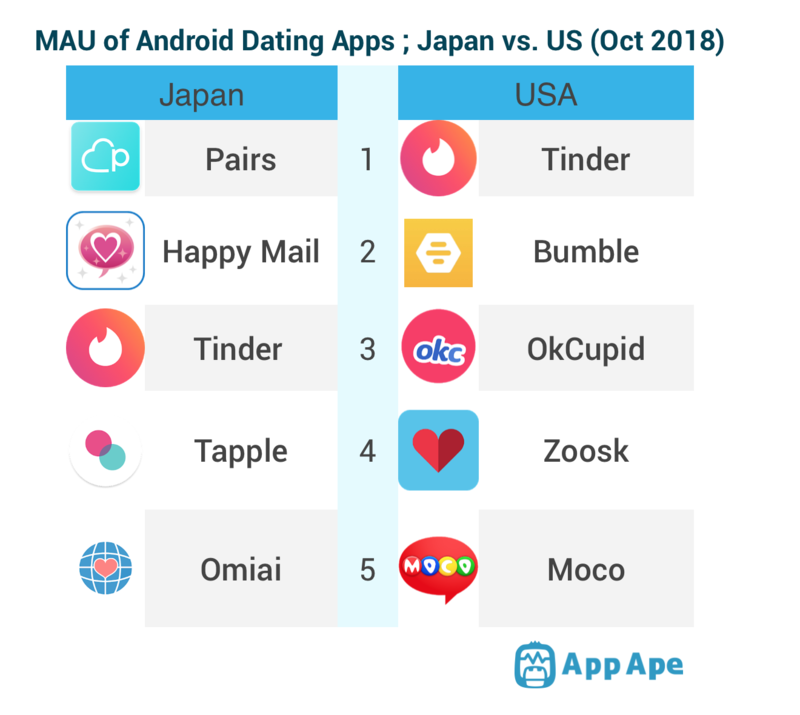 As seen in the chart above, Tinder being the only app that appears in both countries, is ranked 3rd in Japan while in the US it tops the ranking charts based on the MAU in October 2018. Let’s dig a bit deeper and see what differences App Ape analysis can highlight. The graph below represents the monthly active users in Japan and the US. As clearly seen, the number of active users in the US is by far higher (almost 20 times) than to that of Japan’s. This remarkable gap has been going on since last year. 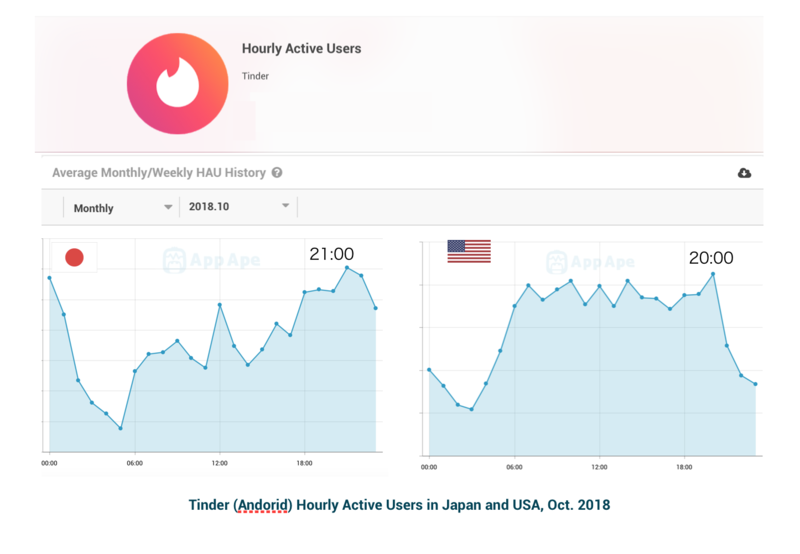 The data in Japan over the past couple years hint that Tinder may have reached its peak and the number of Android users will probably not increase anytime soon. Daily Activation Count, as the term suggests, refers to the number of times the user were active on daily bases. The following indicators clearly represent that 79.2% of Japanese and 67.7% of American monthly active users used the app 7.3 and 8.5 times respectively in October 2018. The two graphs below display Tinder users peak time in October 2018. According to App Ape’s indicators, both Japanese and American users seem to be most active at night (local time). This is expected given it is most likely afterwork hours. 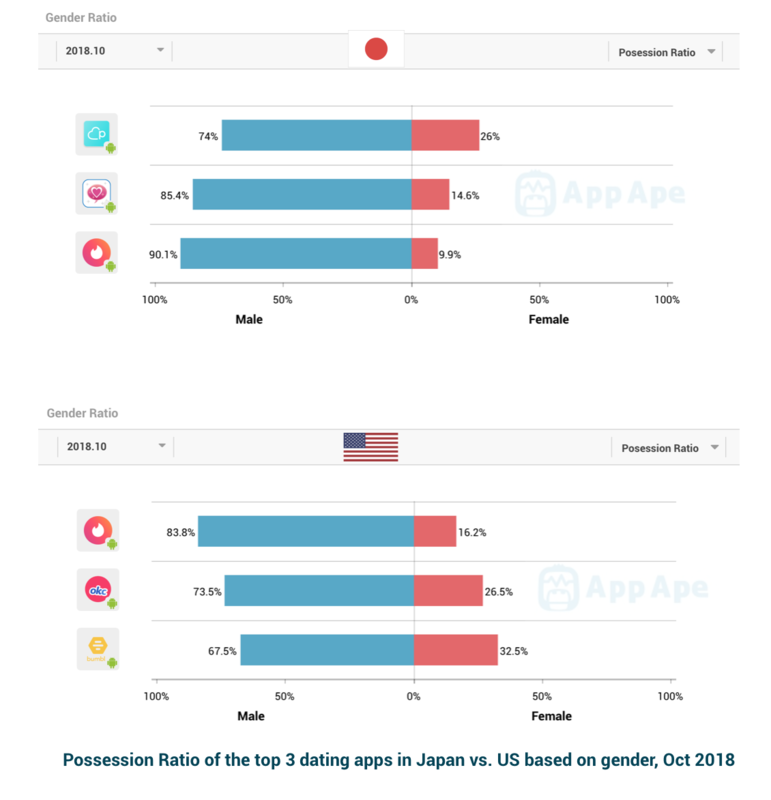 As seen in the data collected by App Ape’s gender ratio analysis tool, the male users, as one would expect, are the dominant active users of all dating apps in both countries making up for over 70% of total users except for Bumble (USA) where the number is 67.5%. Yet again this is not surprising. Women tend to put less trust in such dating apps as it is hard to really know the person on the other side just by looking at a few pictures and reading a short personal profile summary. Moreover, Tinder in Japan has the highest rate of male users amongst other apps (90.1%). This could be due to the app being famous around the world and hence attracting the foreigners living in Japan. On the other hand, women users of Bumble make up the most ratio of female users reaching 32.5% in October 2018. 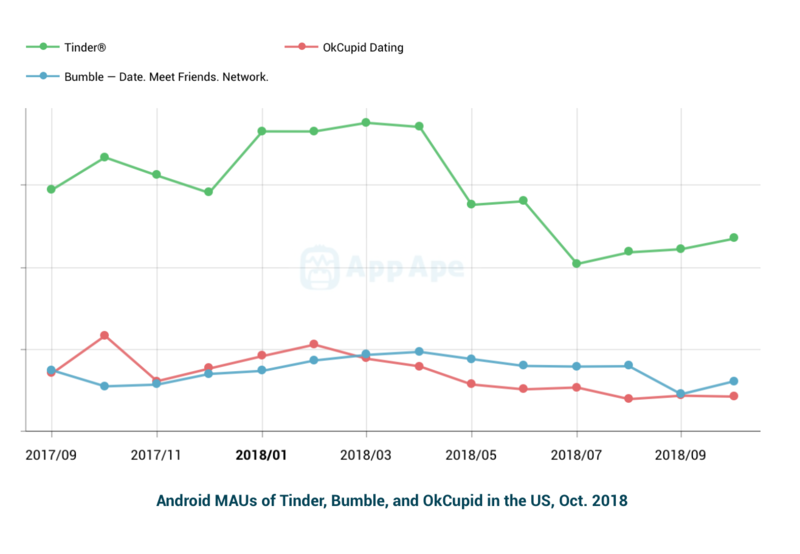 Bumble and OkCupid have been in close contact on monthly active charts over the past year. As seen below, Bumble, once behind OkCupid, narrowly beats the famous app in March 2018 to secure the 2nd place in rankings. However, soon after, MAUs continue to decline until September where the two apps meet again and then Bumble goes up slightly the month after. Will OkCupid recapture its second place next month? We’ll have to wait and see. It is equally important to highlight the fact that Tinder MAUs have been declining over the past few months. However, the rate still remains much higher than any other dating apps in the charts. Pairs, Happy Mail, and Tinder have all been competing hard to secure the top position in dating category rankings over the past year. Even though Pairs had been the top dating app up to October 2017 it lost its place to Tinder and Happy Mail, but then soon returned to the top the next month. 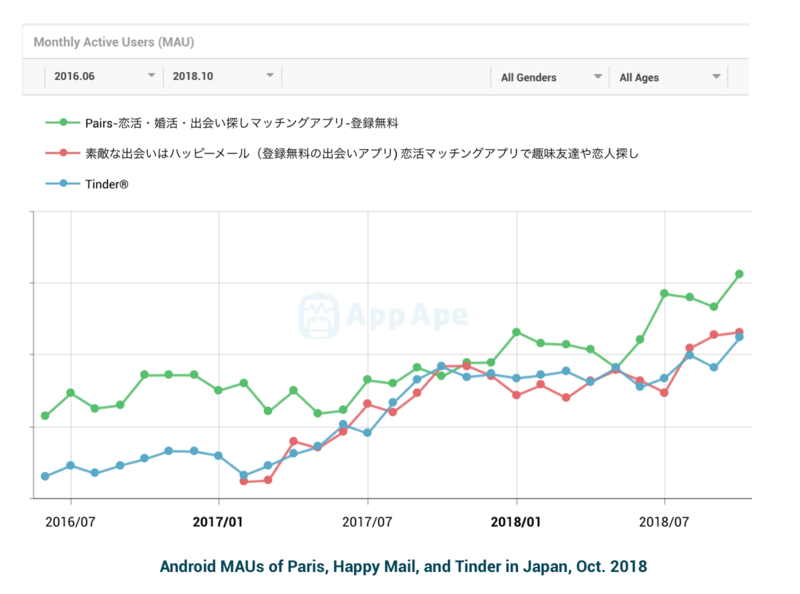 The most close competition seems to be between Tinder and Happy Mail where the two apps have been passing the 2nd position to one another for the past year. 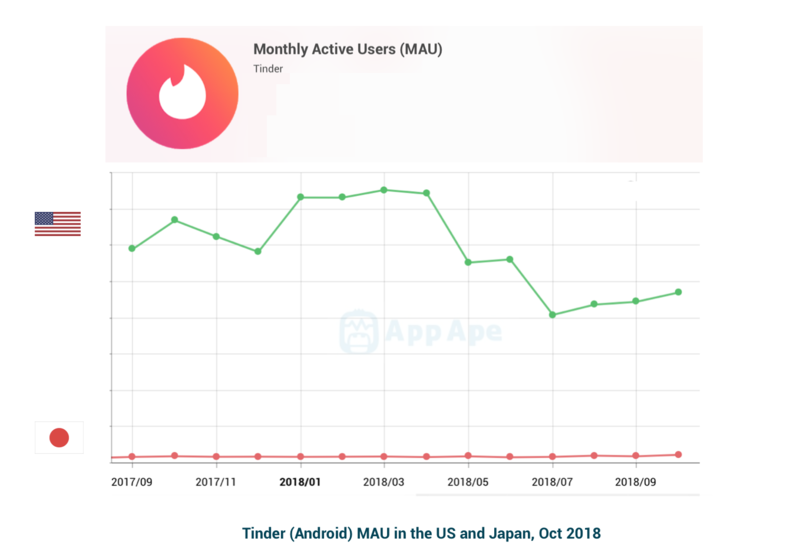 Although ups and downs are quite a lot in the graph below, it can be said with great confidence that MAUs of dating apps in Japan are increasing. According to analysis, from now on the competition is expected to be more fierce and of course fun. Who tops the charts in the near future will be anyone’s guess! App Ape’s mutual app tool allows users to get an insight into the percentage of users who own other apps based on the analyzed app. The analysis shows that majority of Tinder users also own Bumble and around 48% have OkCupid installed on their phone. Furthermore, data in Japan indicate that 30.8% of those who have Pairs on their phone also possess Omiai (ranked 5th in the chart) where this number is only 18.4% for Tinder. The average MAU Data collected by App Ape for all Android dating applications is shown in the table below. In Japan, the average monthly active rate (MAR) of users was 71.96% in September. The dating app Pairs, currently on the top of the charts, have had a higher MAR than the average since January with a peak of 89.5% in July. The ratio in September is 84.9%. In the US, the average MAR is lower compared to that of Japan’s. Tinder, like Pairs, beats all the average calculations. It reached a peak of 71.7% in April and stands at 68% in September which is almost 12% more than the average of all dating apps. 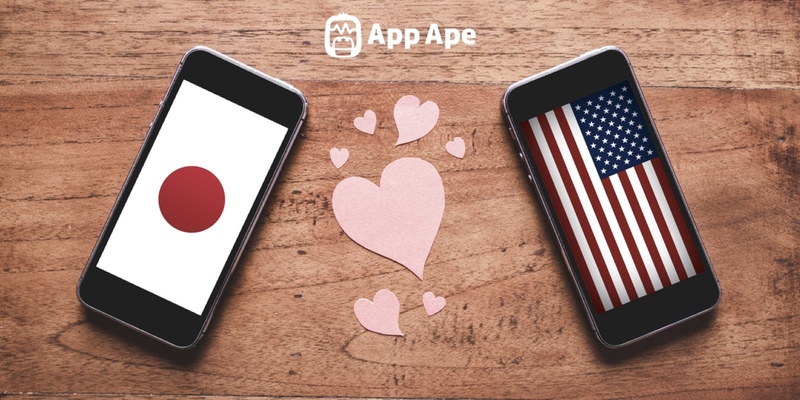 May it be an individual or an enterprise, anyone can benefit from the information provided by App Ape and utilize them to their advantage in mobile application marketplace. Why not join us now and dive into a user-friendly and a precise pool of data analyses.